Hello Ladies so I recently purchased a few of the Brand New Makeup Geek eyeshadows. Now for those of you that may not be familiar with Makeup Geek heres a little info. You may have seen You tube videos my Marlena the owner of Makeup Geek and shes does awesome tutorials, and also has an online store where you can find everything from makeup brushes, NYX cosmetics, Authentic Mac samples etc. I own a few of the brushes from them and I am a devoted Makeup Geek! I was soo excited to try these shadows and get my hands on them . I wanted to mostly because I had read and heard of how amazingly pigmented and such great quality these shadows were. Also because of the pricing . Now those of you may know that I love my Mac makeup but haven’t been able to splurge on any of the shadows just yet and when these awesome products come out it makes it that much harder for me to venture into Mac and pay almost double the price. 48 Highe End Quality Eyeshadows that are Cruelty Free. Marlena claims to have worked hard with the formulation and had a lot to do with the making of these incredible shadows! As Makeup Geeks, we stay true to who we are. Cosmetics are not used to change ourselves,but to enhance the exquisite and unique people that we are. To be a Makeup Geek means to be a reflection of our inner beauty. Right off the bat the packaging is soo colorful and you can tell a lot of work and thought were put into these. 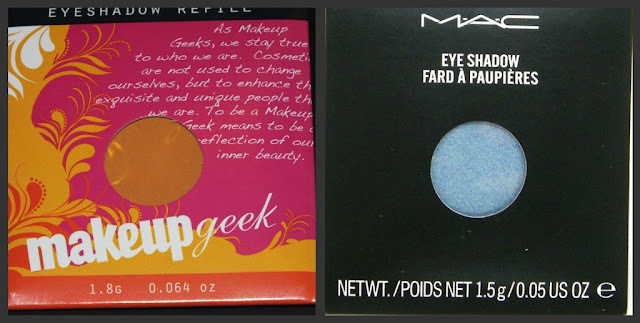 Now here is a Comparison to a Mac Shadow. You get more product and you pay a lot less! All of the shadows came nestled in the colorful envelope and inside of that was this little black sleeve holding the eyeshadow pan. Completely secure unharmed! There has been some speculation that these were comparable to the Coastal Scents Hot Pots.They look similar but honestly any eyeshadow in a pan is going to be put through the ringer and be compared to one another. So far I am really liking these shadows. They are velvety smooth, have great pigmentation and a little more affordable than Mac or even Makeup Forever. I have read and seen many people compare this to MAC Carbon shadow. I unfortunately do not own it but who needs to when you have this! Can you see how insanely pigmented this Black is! My very 1st Z Palette! I could Stare at this all Day Oh my Pinkness! Overall I really like these Makeup Geek Shadows. Will do a look with them soon for you all. Will def get more from the collection in the future! I love all those Makeup Geek shadows you picked up. I cannot believe the pigmentation to that black one. OMG! They are really amazing. And I am completely, totally, and utterly in love with that MAC pigment sample! EEEEEPPP! lovely haul cathy…can u plz tell me more abt their brushes..i m eyeing on few of them..shud i buy them or chuck them??? @ Pavani thanks so much. I really like they’re MUG Blush Brush.I owns about 6 of them and they are perfect for the apples of the cheek and even contouring if need be. I have been looking at the Foundation Brush and been itching to try it but kind of reminds me of the one from Crown that looks identical to it and doesn’t work too well for me because it isn’t dense enough for foundation application . Wow Cathy these look awesome! I have been waiting for someone to review these. I figured they would be awesome, I can’t see her putting out a bad product. These look so pigmented poolside is beautiful I love the cute names she came up with. Great post and those swatches are amazing how there is no primer shows they are great quality. Wow these are so gorgeous! You are such a fast swatcher, girl! Just saw you tweet a pic this morning! 😉 I am so excited to see what ShimmaShimma looks like on the eye. That is Marlena’s signature saying so that is so cute! These look amazing. I don’t have Carbon either, but you are so right, that black is sooo pigmented! Thanks for the pics & swatches! Did you have a good experience with Poolside and Razzleberry? I’ve tried using them several times and they all have lots of fallout and fade during the day regardless of primer and/or an added base. I was just curious if I’d gotten a bad batch? Just trying to see others thoughts on it.